Location to store the data is local and iCloud. iCloud and Local can be used simultaneously. Title, keywords and tag can be attached to the page. Page can be classified using the categories and tags. Pages are sorted by date created. 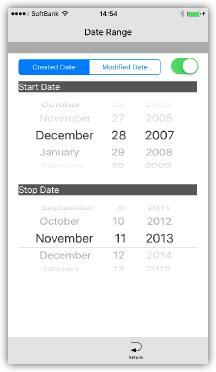 Page can refine by the creation date and modification date. 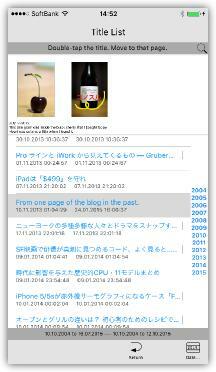 noteCafe has a search function of three types. Page Search, Title Serach, Keyword Search. iPhone and iPad has the same user interface. iPad supports landscape. iPhone does not supports landscape. 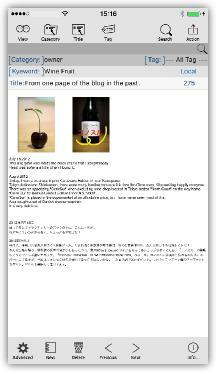 Title and keywords can be attached to the page. Tag can be attached to the page. The page can be edit and delete. When you tap a category, you will see only the pages that belong that category. Category can create, edit and delete. Double-tap the title, the page is displayed. Title List is a page that matches the category and tag. It will be sorted in the creation date. You can refine by creation date and modification date. 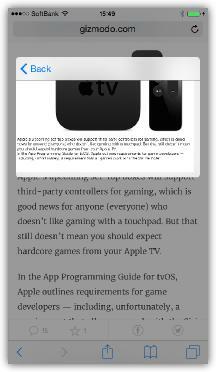 Edit mode allows you to edit the page. But you can not link to URL or phone number. Further, the attached items you cannot save or copy. View mode can link to a URL or phone number. Also, the attached items you can save or copy. But you can not edit. In the edit mode, link operations and attached items also can now be operated. Tap to edit, long press to operate links and attached items. You can zoom page with the pinch-in and the pinch-out. it will return to the default size in the long-press (two fingers). You can use the page search, title search and keyword search. Title list and search list can refine by the creation date and modification date. 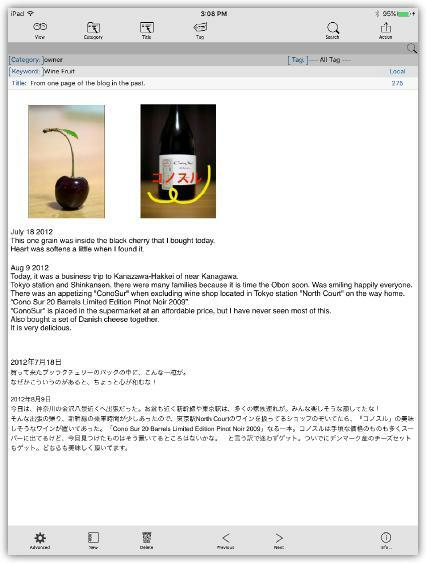 Using a share extension, you can send the information easily to noteCafe from other applications. Supports the Web page, text documents, Richie format documents, images and videos. Also, it supports the file or PDF documents of the Keynote, Numbers and Pages application. Can save text and images, and movies. Page format is RTFD format. Title and keywords will can be attached to the page. The tag can be attached to each page. Can create, edit and delete a category. Can be classified by category and tag. The preservation of data can use iCloud and Local. 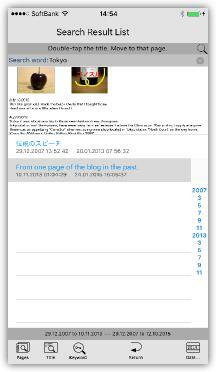 noteCafe is limiting the file size. Max 30MB. Can search all target pages. Search content is the text data in the page. It does not search the metadata. Can search all target page's title. Can search all target page's keyword. The search target is the page that matches the categories and tags. Can refine the search results list and title list by the range of creation date. Can refine the search results list and title list by the range of modification date. Lists and tables can be inserted. Export and the import of the page. Even if a storage is local, you can share data. It supports via the iCloud or via the iTunes. Can recover a page that has been deleted. Can change the categories and tags of the page. When an index necessary for the operation of noteCafe is damaged by some kind of accidents, noteCafe can rebuild an index. noteCafe does not support the auto-save feature of iCloud. When you saved it with a save button, the editing page is sent to iCloud. If a group member are editing at the same time a same page on the iCloud, it is updated by the page contents of the member who saved it first. Notification is sent to the other editors. 1. 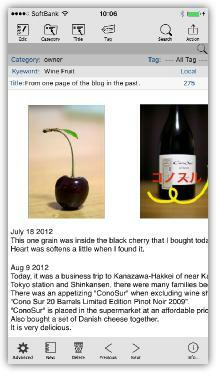 The print format has been changed..
Now you can print in the same format as the layout shown on the page. 1. iPad Pro (10.5-inch) and iPad Pro (12.9-inch 2nd generation) are supported. 1. Improved stability of printing function. 1. Fixed a bug where images are not attached when sharing pages. 1. iPad 9.7-inch was supported. 1. The title extraction function was improved. 2. Edit and link access is now easier. Editing can be done by tap. You can also access links and attachments with long press. 1. Lists and tables can be inserted. 2. Cut, copy, and paste behavior has been optimized. 1. Supports the IOS 10. 1. It was to be able to print at the optimal size to the printing paper (A4). 2. It was abolished the update process message of iCloud, which has been displayed at the time of start-up. It will be processed in the background. 1. 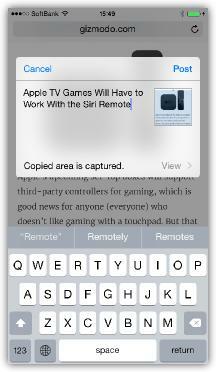 Fixed a bug that could not be used the page search in the iCloud. 2. Application version number was to be displayed. Copyright © 2004-2017 in-bluesky. All rights reserved.